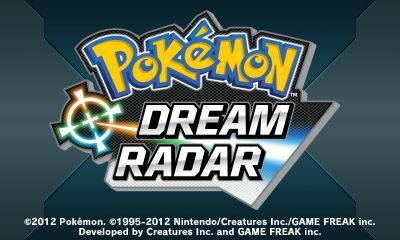 Pokémon Dream Radar is a new game for the 3DS eShop. This game is an Augmented Reality game to tie in with the main games: PokémonBlack 2 & White 2 and features you obtaining various Pokémon within an Augmented Reality environment. You get guided through the game by Professor Burnet, a female professor who specialises in this capture system and is investigating the Interdream Zone. This game also features compatibility with the Generation IV games: Diamond, Pearl, Platinum, HeartGold & SoulSilver where it brings special Legendary Pokémon into the game if you have the Generation IV game in your 3DS.